3 active kids, summertime activities, 24 weeks pregnant, and ALL my energy spent on maintaining the bare essentials of life has taken every ounce of strength from me. 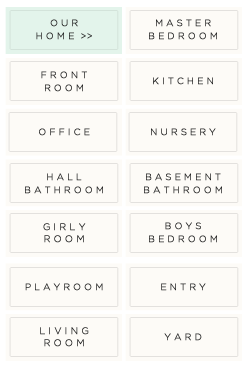 Nonetheless, I've been working slowly on each room in my house, hoping to complete them before this "little bundle" arrives. YAY....so happy it's done and SO excited to show you all! 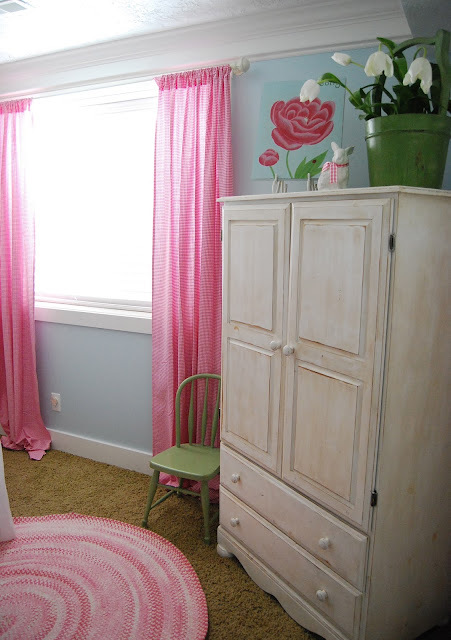 Her bedding, curtain and rug come from Pottery Barn Kids; I found everything either online or on eBay. the shop named Amber Rose Garden TRULY Amazing quality!!! Her armoire is a piece I bought for her when she was still in my tummy. We made this armoire into a make shift closet in our tiny, little college apartment. With Megan being our firstborn, there are so many memories attached to this armoire. It makes me a little sad to think that the armoire that once held her little newborn clothes, now slightly altered holds a TV and DVD player. Oh how life passes us by so quickly! The flowers, bunny and green bucket have been in my decor collection for years. 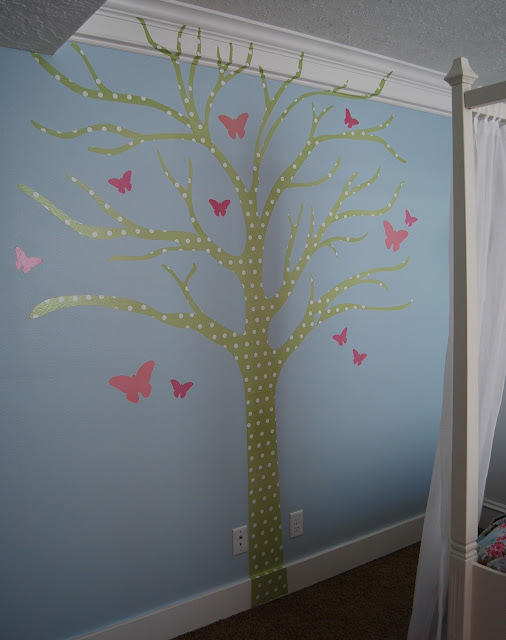 The flower print above,and vinyl tree below is also from PB Kids. Her bed is from DownEast Home, but again a Pottery Barn piece. Can you tell that I like Pottery Barn just a little? The Paint is a Benjamin Moore color called "Heaven on Earth." It's by far my FAVORITE blue paint I have ever used! I thought you might also like to see a brief history of the making of this room. Brett did such a great job on the trim, Love my handy man..MUAH!!! Pretty, but didn't reflect our little Megan's personality. Now onto the next big project, a Baby Girl nursery! ADORABLE room!!! Great job Mom!!! 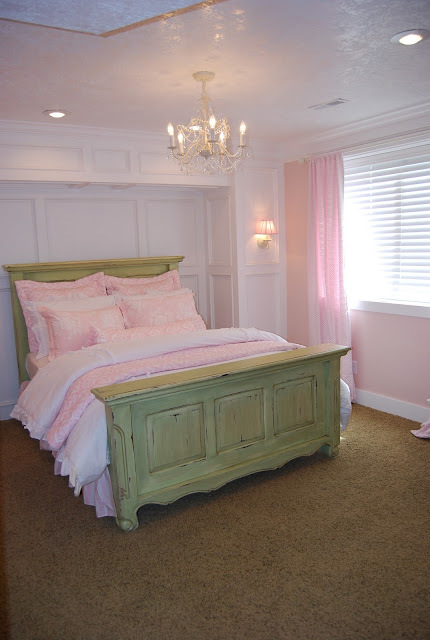 Love the colors, bed, chandy over the bed!!! Love it all!! Love, love, love this room! Where did you get the monogrammed M pillow? So adorable! Love it!!! But I have to ask- where did you get the rug from the shot with the green turned white bed??? I love that and it would be so wonderful in my daughter's big girl room we are working on!!! But I love the rug too, would be nice to know where to get one. Ok everyone, you keep asking about the 2nd rug in the post. I bought that rug about a year ago from Pottery Barn teen! It was a HARD one to let go of, it was a awesome rug, but it had a ton of orange in it and I'm not really a fan of peachy orange. They don't sale the rug anymore, but I have seen it on eBay here and there! Great Job On her Room it looks Great. Love your Style!!! Congrats on your Upcoming little one!! Keep up the good work!! Loos adorable Heidi!! Great job!! Looks sssooo cute! Where did you get the first bed? (The green now white one?) Love the trim work! 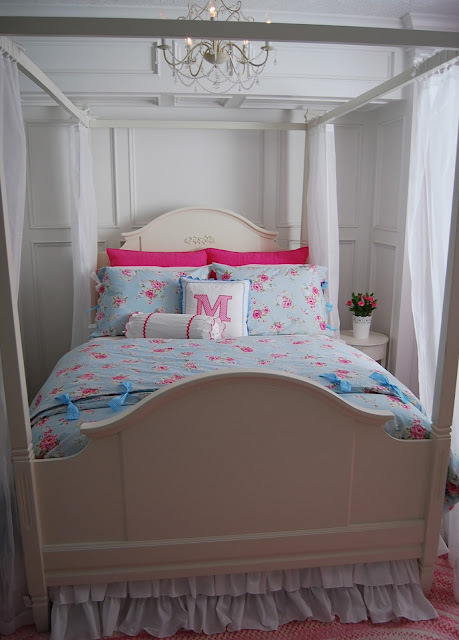 I am so in love with this bed! Could you tell us the retail price?? Or where to find something similar?? 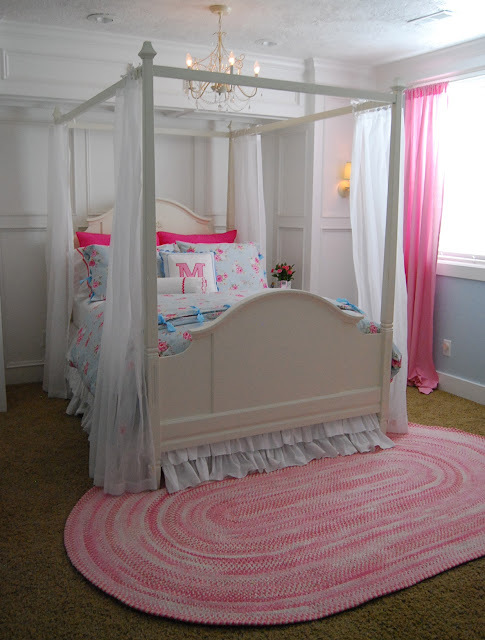 I want to do something sweet and girlie for my daughters room and this has been major motivation and inspiration!!! I just need some HELP!!! Ok so about the bed! I bought this bed at downeast for $399 then another $99 for the canopy part. Downeast is tuff because you never know what they have in stock at any given time. But pottery barn kids sales the same bed for of course a lot more :( but if you love it, you should go for it! I promise you won't regret it!!! I found your blog when I googled "heaven on earth" paint. I also have the Savannah duvet for my daughter who is 8, and I'm wondering if I could pick your brain about the paint color?? Her bedroom is just being finished in our basement and I don't have any extra trim besides the baseboard and window casings. 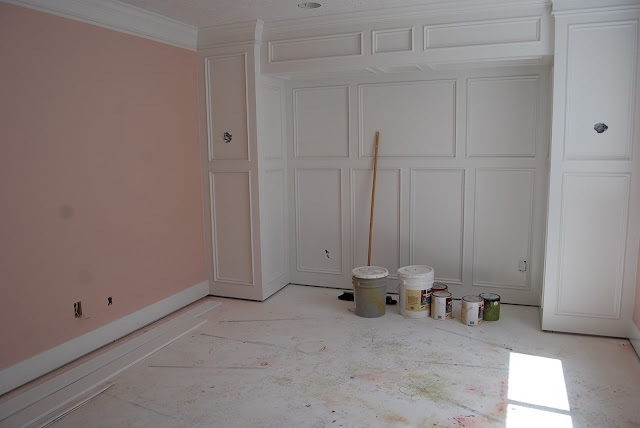 Would you have used a lighter version of this paint if you didn't have all the white trim on her walls? I'm worried it will look a little too "blue" if you know what I mean! I'm planning on white bedroom furniture and white curtains with a dark pink stripe around the edge from PBK. I love this room! I found your blog when I googled, "heaven on earth" BM paint. I also have the Savannah bedspread for my 8 yr old daughter's room that we are finishing in our basement. I was wondering if I could pick your brain about the paint color?? We have to have the colors to our painter tomorrow. 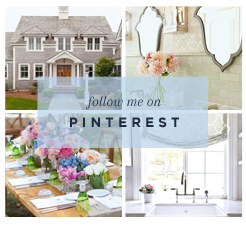 Would you have chosen this color if you didn't have all the white trim on her walls? We only have baseboards and window casings. I'm worried this color/room will look to "blue" if you know what I mean:) She's going to have white furniture and white curtains with a dark pink stripe on the border from PBK. Thanks!! 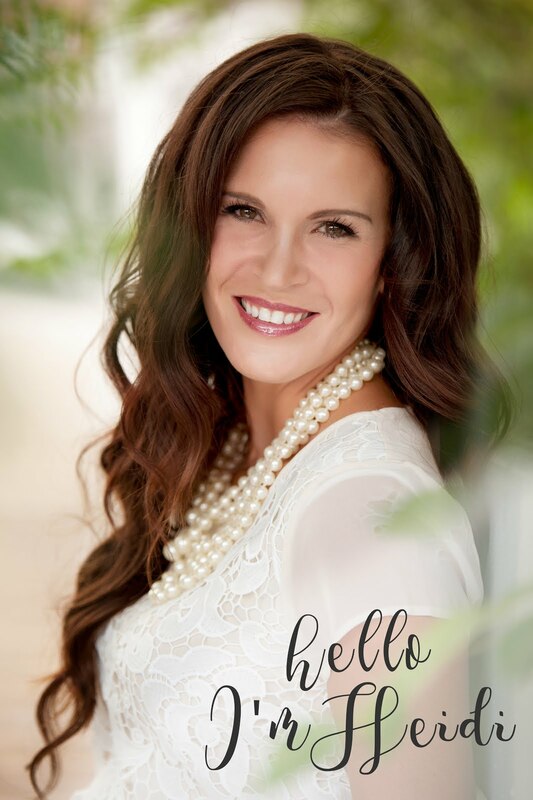 Hi Nicole...If my room didn't have so much white I would properly go a shade lighter! Its a SUPER pretty blue...But all over the walls, you are right about it being to blue!! Another blue that I love from Columbia is called snow cloud. It has a bit of grey in the paint but on the wall its a soothing pretty blue color. I'm a first time commenter and I just accidentally found your site (I don't even remember how I found it)...anyway..I ABSOLUTELY LOVE THE FLOWERED RUG...DOES IT HAVE A NAME SO THAT I CAN FIND IT OR DO YOU KNOW WHERE I CAN GET IT? THANKS SO MUCH FOR YOUR TIME.